The beauty of Hong Kong is that restaurants and bars are always popping up or rebranding itself in order to capture the ADD Honkies that seem to get bored quicker than the rest of the world. Yun Fu, of the Aqua Group, has transformed a section of their restaurant into an Old China inspired lounge and bar space obviously hoping to tap into the happy hour/ drinking population. 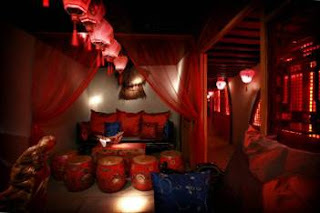 Dimly lit by traditional red lanterns and adorned with traditional furniture and Buddhist artefacts, the ambiance of the place can be interpreted as soothing or eerie depending on how busy the place is. Drinks at the Yun Bar include some interesting Chinese cocktails such as Pui Mu (HKD78), a decadent rice wine infused plum cocktail mixed with refreshing cranberry juice; Bo Ba (HKD68) a green bamboo wine mixed with triple sec sugar syrup and tart grapefruit juice and Mi Ya Luo (HKD68) a brown rice based wine blended with a sweet and sour passion fruit syrup and sprite. For further information on Yun Fu, please visit www.yunfu.com.hk.